Once your Internet connection is working again, simply click the reload button in the URL bar. 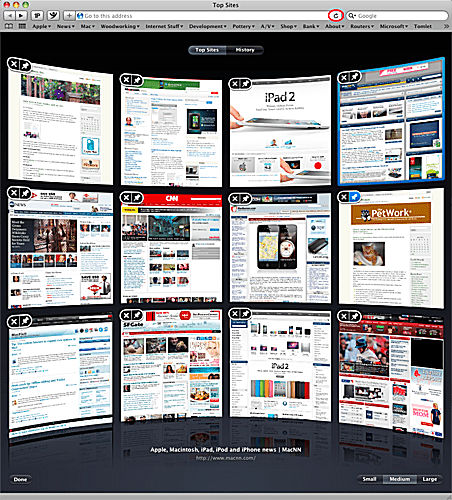 Safari's Top Sites feature is a handy way to quickly access your favorite sites. The Top Sites page displays your favorite web sites in thumbnail view, so you can quickly scan multiple web sites for new information. This can be particularly helpful for news or technology sites, where pages are updated frequently. But Safari's Top Sites feature can get bogged down if you lose your Internet connection, even for just a brief time. Whether the cause is your home network router, DNS issues, or your ISP going offline due to a severe storm in your area, an interrupted connection can sometimes cause the thumbnails in Safari Top Sites to either stop updating or display error messages. Luckily the fix is simple; so simple, in fact, that it's easy to overlook. Once your Internet connection is back in place, simply click the reload button in the URL bar or press command + R on your keyboard. If some of the Top Sites fail to update, try holding down the shift key and then clicking the reload button. That's it; your Top Sites will refresh with new thumbnails.